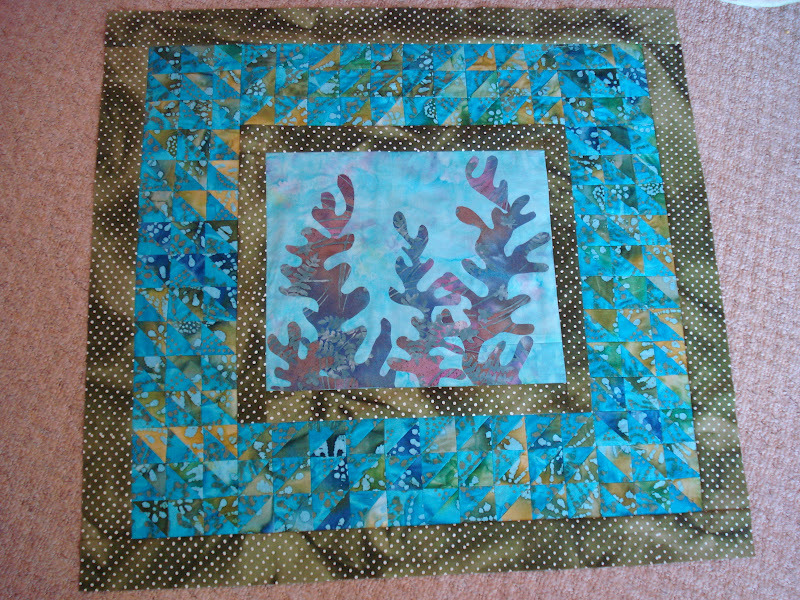 While I wait for the wadding to be delivered for the butterfly quilt, I thought I needed a little project to keep me going. 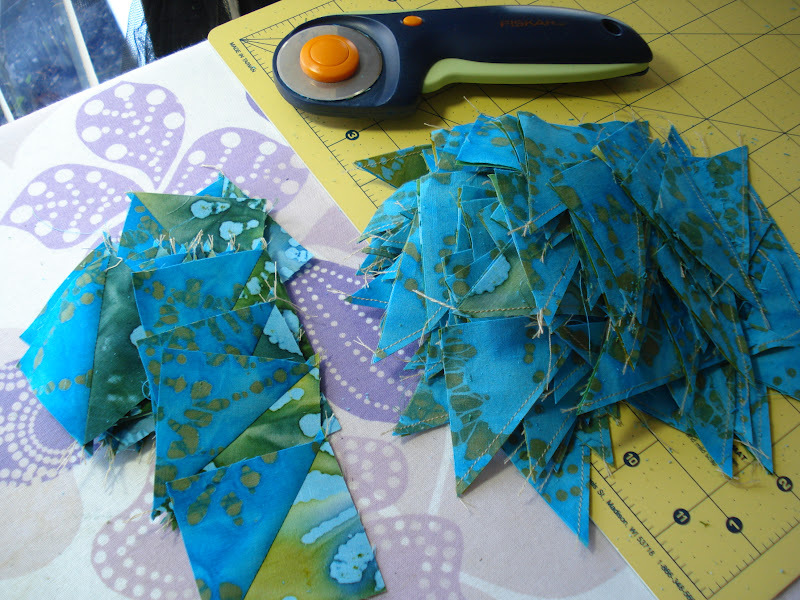 I started with this pile of bonus HSTs from the afore mentioned quilt. I thought these would make a nice border for something, so sticking with the aquatic theme I decided to do seahorses. 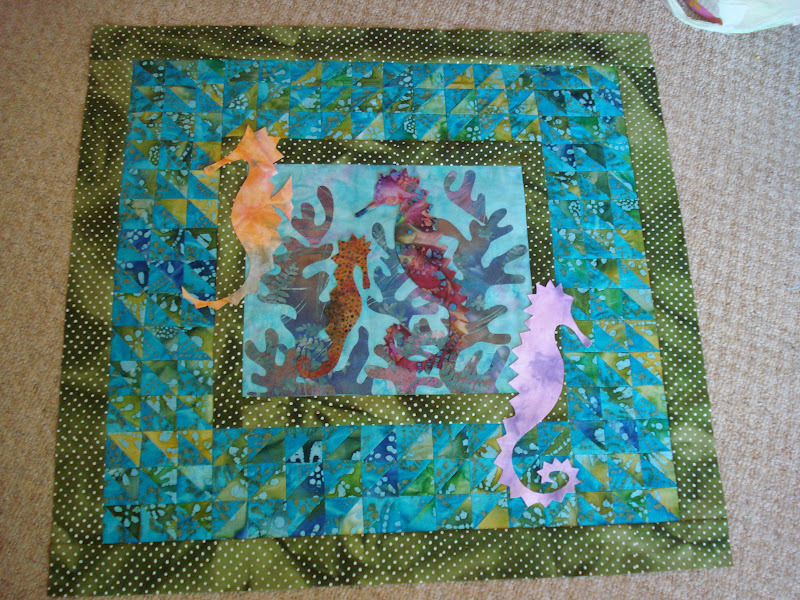 I chose some yummy batiks for the seahorses.. I used Bond-a-web for the first time and I love it. Before I ironed a stabiliser on the back, cut out my design and then used basting spray to attach before sewing. The Bond a web is much quicker and I can see me using a lot of this in the future. I'm not sure if I like the way this one is going but I'm too far down the road now. I quite like the way the center seahorses are 'hiding' among the corals. Hopefully the seahorses will come to life when I've added some features and detail. Hope to get this finished today if I get a good run on it. 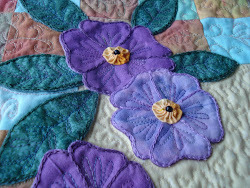 I'm linking up with Connie's blog ,Quilting By The River so why not pop over and see what eveyone esle is getting up to toda. That is so pretty!! 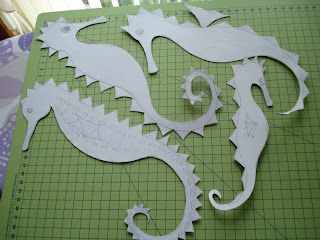 Looks like the two outside seahorses are guarding the inner ones. Beautiful. 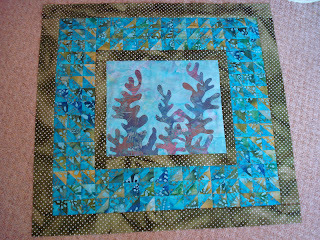 What a beautiful use of those batiks. 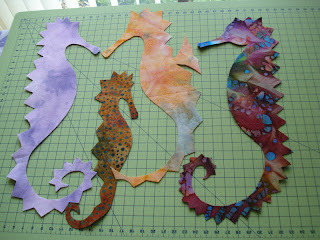 Lot's of opportunity to play with embroidery on the seahorses. This is so beautiful! What a perfect way to use up your HST's and love the little sea horses! I always use Heat n Bond Lite and love it. Thanks for sharing! I'm amazed! I saw that you have the left over HSTs, but I have not been following your blog long enough (I guess) to realize they would be used immediately and in such a mouth-droppingly beautiful way!. Misty Fuse is better, it stays soft and drape-able Unlike the bondaweb which is stiff. would you mind talking in depth (or steps) about the process - I have never used the fusibles and don't know where to start. Thank you! Thanks for the tip Jan. I will need to investigate if that is available in the UK. Sounds good.